The 43rd Raas Mahotsav of Barpeta district in Assam is in full swing now, which began from November 22 with a 15-day programme. During these days, huge gathering of devotees are seen at ‘Bhagawati Kshetra’, the venue of Pathsala Raas Mahotsav. 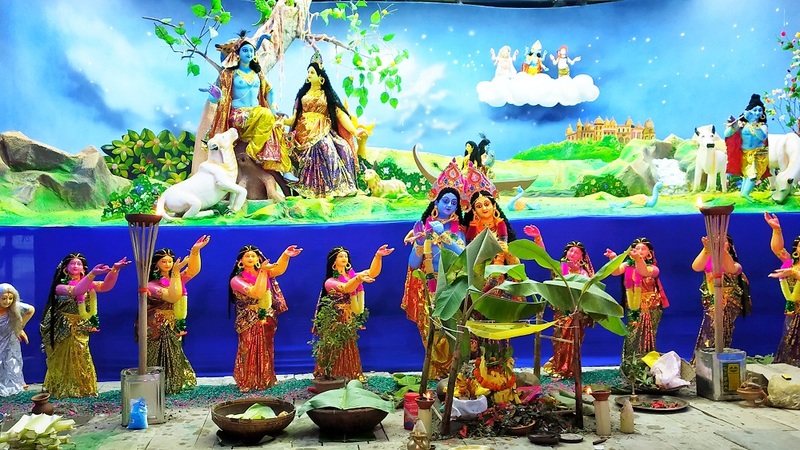 Devotees from various parts of the State visited the Raas Mahotsav for enjoyment of the main attraction – of clay arts symbolizing Lord Krishna. Several other clay arts have also been displayed at the venue that depict some of the burning problems of the State like witch-hunting, man-elephant conflict, and other clay replicas of landmark monuments like the Eiffel Tower, apart from many moving idols which are some attractions of the event. Various cultural and religious programme are being organized during these days. The Raas committee appealed to all to visit to the Raas Mahotsav to enjoy the festive cultural programme also attended by eminent singers and urged all to cooperate in the smooth functioning of all the programmes. The Raas Mahotsav will conclude on December 6 and the cultural programmes will have many artistes performing, including guest singer Rituraj Mahanta and Bijay Kashyap.